I was browsing YouTube for something else when the site suggested this clip. I watched it and liked it. I'm not sure the river raise alone would have won the hand, but the raise plus a well-conceived little speech did the trick. Won't you please donate now to help cure narcolepsy? Two Sundays ago I played the evening HORSE tournament at the Orleans. Fairly deep into it, this woman got moved to my table, on my immediate left. She fell asleep. All. The. Time. If she wasn't in a hand, she'd fall asleep. If she was in a hand, she'd fall asleep while waiting for her turn. 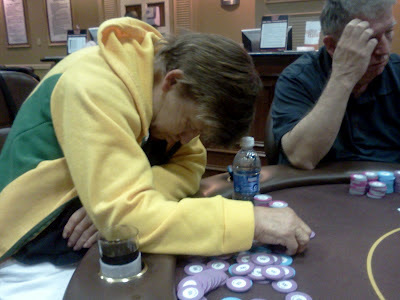 I've seen people fall asleep at poker tables before, but never as many times as this woman did. And she had two additional characteristics that set her apart from other sleepers I've encountered in the past. First, as soon as she woke up, she was able to perceive exactly what was going on. She didn't have to ask what game we were playing or how much the bet was. It's like this information sank into her consciousness by osmosis while she snoozed. Second, she was winning nearly every pot she contested. She was one of the most astoundingly lucky card racks I've ever seen. She just could not lose. And since she fell asleep as soon as the dealer had pushed her a pot, she never had time to stack her chips, so they just kept accumulating in a ever-growing, ever-messier pile. As far as I could tell, she was not drunk and she was not faking, though both possibilities seemed sufficiently plausible to me that I watched her carefully to see if I could detect signs of either one. I could not. The dealers were annoyed with her, because--surprise--they don't consider it part of their job description to wake players up from naps. The floor guy did nothing more than occasionally ask her if she was OK, to which she would give an energetic "Yes, I'm fine." And then drop off again. She eventually knocked me out, first one to bust at the final table, about three spots short of the money. In keeping with the rabbit's foot she must have had surgically implanted, we were playing stud, all in on 6th street, me ahead with a bigger two pair than hers, and she caught her four-outer to make a full house on 7th street. This bizarre approach to the game worked so well for her that I'm tempted to take an Ambien right before my next tournament. 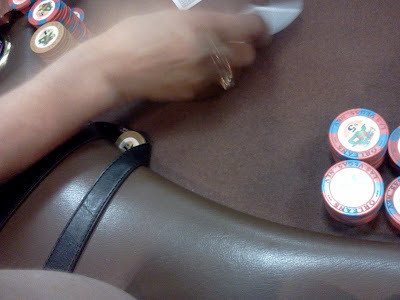 I was playing at the Orleans recently when a woman joined the table in the seat next to me. First thing she did when her chips came was jam one under the rail and hook the strap of her purse around it. I've seen devices made for this same purpose--you anchor it under the rail and attach your purse to its hook--but I've never seen a poker chip put to use this way. I tweeted this photo when it happened, and one follower suggested that this is actually fairly common, but I don't think I've ever seen it before. Arrangements are all made. Barring some unforeseen last-minute glitch, this will become the new Grumpmobile Friday morning. Bunch more photos and full review from Edmunds.com here. And here's what Car & Driver magazine said of it when placing it on their annual "10 Best Cars" list--for the sixth year in a row. 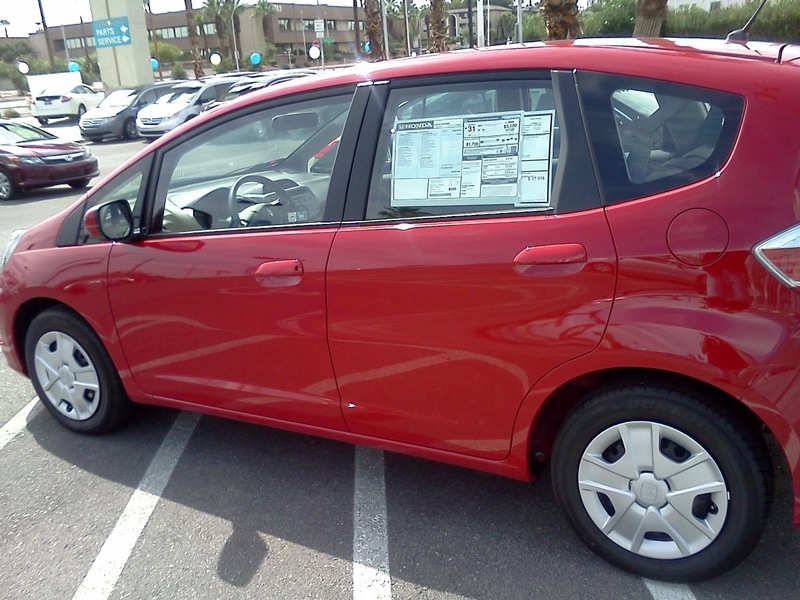 Readers who have unusually keen memories may recall* that way back in 2008 I mentioned that a Honda Fit might be my next car--and so it shall be. Those who have frighteningly keen memories may recall that on that occasion my buddy Shamus made a joke in the comments about "Fit or fold." I can now finally answer: Fit. *Is it bad luck to use the word "recall" in a post about a new car? It has come time for me to part ways with my beloved old Honda and make room for its replacement (about which more soon). I bought it brand new 20 years ago almost to the day, and it has served me well. But all good things must come to an end. So now it's for sale. I haven't listed it in any of the standard places yet, but as long as I have my own little forum here, I thought I might as well use it. This is a 1992 Honda Prelude Si 2-door coupe, with the uncommon 2.3-liter engine and 5-speed manual transmission, 177,425 miles. It has some rust from my years of living in Minnesota, plus some passenger-side body damage from a collision with a deer about 10 years ago. I know of a couple of major repairs that will need to be done at some point, plus a host of minor problems that are part and parcel of having a car this old. I will spell all these out and supply many more detailed photos to anyone interested. But the drivetrain is fundamentally sound, interior in nearly perfect condition, new high-performance tires. Asking $1750. Contact me at rakewell1 at yahoo. Dot com.